My oven gets cleaned regularly because my husband is so well organized, he sets calendar reminders to turn on the self-cleaning cycle. That makes it much easier because there is very little ash to wipe up afterward. But I have to admit that when it comes to oven mitts, I don’t have that level of organization. 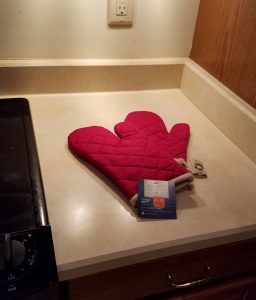 Last week I realized that it had been about five years since I bought oven mitts and, well, they looked like it. So I got new ones when I bought groceries on Thursday. Now the kitchen is looking brighter with new oven mitts instead of the old faded ones, which were still functional but had a few rips and stains. 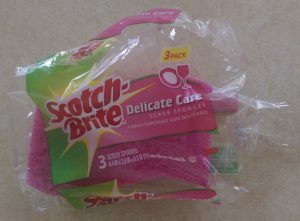 Small kitchen items like that are cheap, so I wasn’t trying to save money by not replacing them sooner; I just hadn’t given it any thought. It makes more of a difference than it might seem, though, because when we regularly see shabby worn-out stuff we’re subconsciously left with feelings of lack and stagnation. Bright new little things coming into the house make it feel like there’s plenty of abundance and good cheer! * Good Things is a weekly series featuring the many unexpected joyful things that show up when clutter and stagnation have been cleared away. It’s meant as a reminder that life is always full of happy little surprises, when there’s enough space for them! 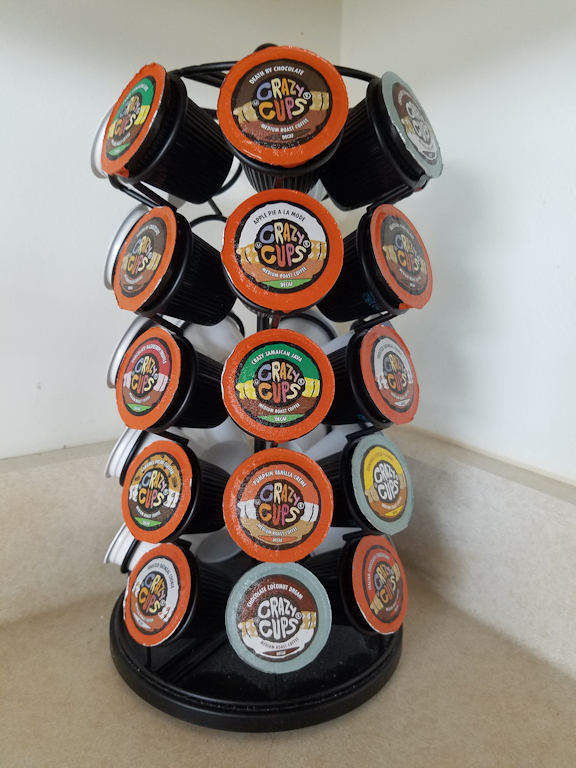 I like them too; and although I haven’t given up caffeine, I do agree it’s best not to overdo the stuff, and having a variety of options is always good! Birds and small animals occasionally drink from the little fountain on my front porch (shown here). 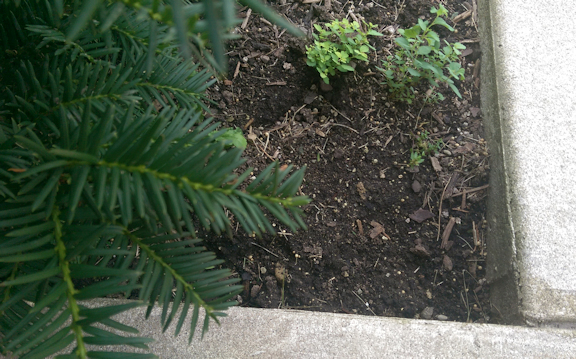 Today I saw a chipmunk and was going to take a photo, but the chipmunk was scurrying away under a bush by the time I got back there with my phone. I noticed that the bush needed mulch and that a few small weeds were coming up around it. Of course, there’s always something in the yard that has weeds or is otherwise in need of maintenance—we expect that. Then I started wondering, why do we expect so much more from ourselves than from our gardens? 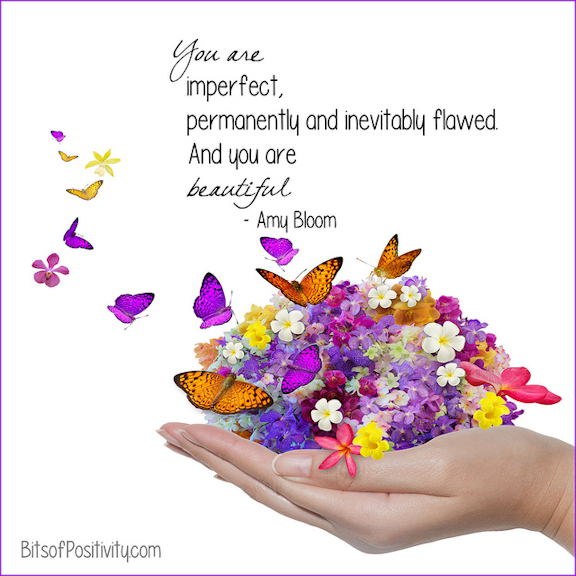 We wouldn’t complain that a garden was a bad garden for having a few weeds, but we criticize ourselves for all kinds of small imperfections. We might do better simply to accept the fact that, just like the yard, we’re always going to have a weed here or there! This past week was rather quiet. On Friday, my husband added a jug of vinegar to the grocery list, for cleaning the hard water stains off our boat. I wondered what sort of sponges to use. Plain soft sponges might not get those spots off, but kitchen scrub sponges might be too harsh and leave scratches on the carbon fiber. So I looked around at the supermarket and found a pack of “Delicate Care” scrub sponges. The hard water spots came off quickly and easily, with no problems. And that left me thinking—sometimes it’s useful that our consumer economy has so many varieties of whatever we might want. Although everyday items can end up as clutter if we’re not careful, buying the right tool for the job doesn’t always mean it will end up in a heap of stuff that never gets used again. What’s needed is a healthy balance. Now I’m left wondering why my subconscious mind wanted to give me a coffin-shaped box. Maybe it’s telling me that there is something in my life that needs to get buried, or boxed up and put away, such as old habits or ways of thinking that no longer serve me well. The investigation could mean that whatever might get buried or put away is unknown. Maybe the police are there to stop me from going too far and “murdering” some part of my life that is good and healthy. The dream could have been telling me not to worry because it wouldn’t actually happen. If any readers have more suggestions, feel free to post them—I’m curious! 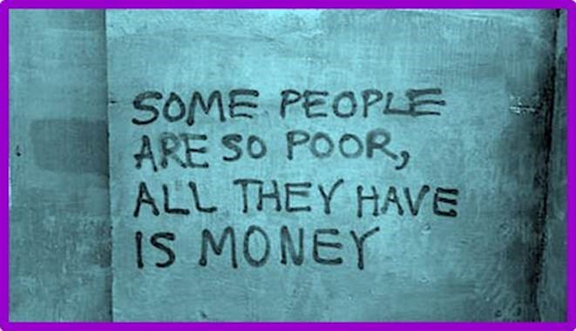 Because there are so many consumer goods and advertisements for them in today’s world, people often feel poor as a result of not being able to buy everything at once. Even though many of us actually have lots more stuff than in the past, it doesn’t always feel that way. So, when those ads make us feel like we don’t have enough, it’s best to keep in mind that the most important things in life have nothing to do with money. 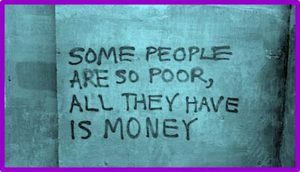 Having an expensive house and buying all the latest cars and gadgets may be fun, but it doesn’t necessarily mean that a person is rich in what really matters. Earlier this year, I put a box of store-brand facial tissues in my bathroom because the supermarket gave some away for free to get people to try them. I wasn’t much impressed. The box had a plain, boring design, and the tissues felt coarse and hard. When I needed a tissue, I usually went and got a Kleenex from somewhere else in the house instead. That box sat on the bathroom counter for months. 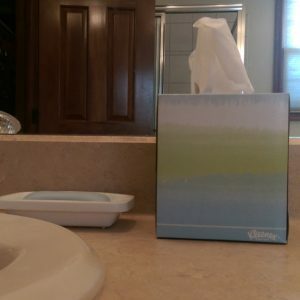 When the freebie tissues finally got used up, I bought some real Kleenex in a box with cheerful summer colors, which immediately made the bathroom feel like a brighter and happier place. And then I wondered why the heck I hadn’t done it sooner. Avoiding waste may generally be a virtue, but using up every one of those cheap tissues the supermarket gave away while they left my bathroom looking blah for months was taking frugality to an extreme! 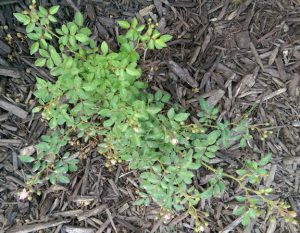 I mentioned in a Nurturing Thursday post last year that three of my rosebushes had died of a virus. 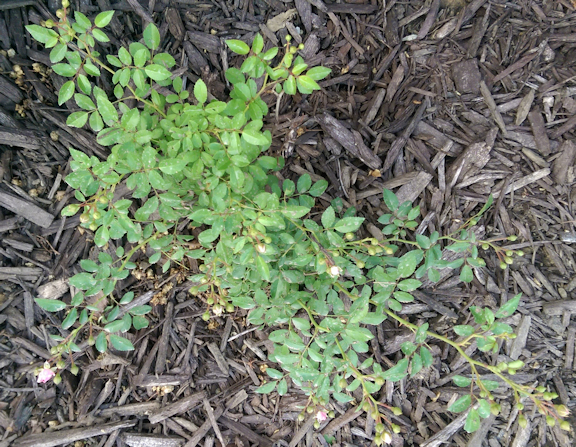 Now I have replacement bushes that are doing nicely. They’re still tiny and not yet in bloom; but they do have buds and look like they’re thriving. At the end of the season I’ll cut back the older bushes enough so that everything will be the same size. 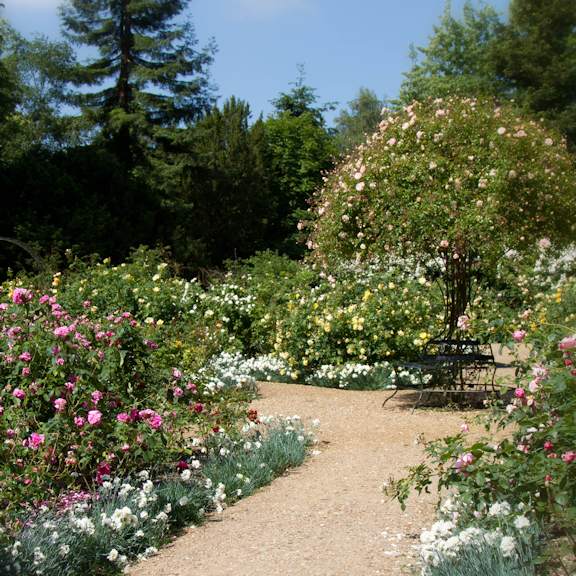 By next year the rose garden should be back to looking like it always did. Even though losing some of the bushes seemed awful at the time, it really wasn’t all that hard to repair. That’s true of many things, and it’s a good lesson to keep in mind! Among my blog posts this past winter, I wrote about stories remembered from childhood and how they have a subconscious effect on perspective in adult life. I mentioned two novels on my bookshelf that had influenced my worldview as a teenager. One of them was The Left Hand of Darkness, which encouraged me to trust my intuition and to believe I could change the world, while also leaving me fearful that taking decisive action might lead to being attacked by enemies. The other was Marnie, which I decided to leave for more discussion later. 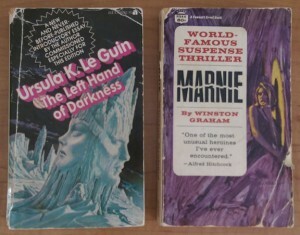 Marnie is a young woman in the early 1960s who lives in England (unlike Hitchcock’s movie based on the book, which is set in the United States instead). She grew up poor, raised by her mother after her dad was killed in the war. Leaving school at a young age, she became a thief. She takes jobs under false names, enjoying the drama of inventing new lives for herself, and steals the payroll (in those days, wages usually were paid in cash). Although she uses some of the stolen money to support her mother, who doesn’t know what she has been doing, Marnie spends most of it on herself. After every theft, she lives comfortably for several weeks at an inn under the pretense of being a wealthy lady, with nothing to do but ride a horse that she keeps boarded at a riding stable nearby. Eventually she lets too much slip about her personal life when talking with Mark, a part-owner of a printing company where she works. When she absconds with the payroll, he quickly tracks her down. But instead of turning her over to the police, Mark tells her that he has fallen in love with her, and he proposes marriage. Rather than counting herself lucky, Marnie feels trapped and resentful. She hates the whole idea of being married, but she goes through with it anyway because she doesn’t know what else to do. She daydreams about running away to France, and she gets even angrier when Mark insists that she visit a psychiatrist regularly and when he wants to repay the money that she stole from past employers. After her mother dies suddenly, leaving some ugly secrets exposed, Marnie decides not to run away after all. She feels that there is nothing about her old life that she wants. Even though her marriage is a mess and she has told Mark plenty of lies, she makes up her mind that she should at least talk everything over honestly with him, and see where things go from there. When I read that book in 1980 or thereabouts, I didn’t understand it in the way that its (male) author probably intended—that is, a psychological drama about a mentally unhealthy woman slowly learning to accept normal social behavior. Instead, Marnie came across to me as a feminist archetype, insistent on staying in control of her own identity. Yes, she definitely had some issues to work on; but she wanted to deal with them herself, rather than meekly conforming to other people’s demands. To that extent, Marnie was a positive influence on my younger self’s development because she gave me confidence that I had the power to control the narrative and to define myself. Marnie’s worldview left much to be desired in other respects, though. She was very defensive and resentful, both toward others and herself; she never felt safe, but was always afraid she’d make a mistake and everything would come crashing down. She sneaked around like what she was—a thief. The overall message I got from this story had much in common with what I’d taken away from The Left Hand of Darkness—that I could change the course of events, but that doing so would always meet with resistance of one sort or another. When I was younger, I liked the drama of taking control of the narrative, but I didn’t understand how much harm could be done by the cumulative stress from subconsciously expecting resistance and enemies. I also didn’t understand that it tends to be a self-fulfilling prophecy—when we’re constantly on our guard looking for enemies, we generally manage to find them. When we feel that we can’t ask for help without something bad happening as a result, that is likely to come true as well. So I took an imaginary trip to England a half-century ago, wanting to check up on Marnie and see how things had been going in her life since she made the decision to stay in her marriage. 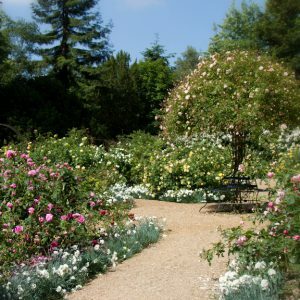 I found her standing on a path in a well-tended garden with masses of lovely roses on either side, on a bright cloudless July morning. She was heavily pregnant, and her eyes were half-closed as she stood quietly, breathing in the fragrance. Bees buzzed contentedly in the blossoms. “You’re looking very well,” I told her, with what I intended as a reassuring smile. Marnie’s lips twitched nervously in response. “It’s rather a lot to get used to—marriage and motherhood, I never felt that I’d be suited to either; but here I am. And you’re not real, are you? I never let anyone know this, but I was always afraid of going mad.” She touched my left arm cautiously, and her fingers passed right through it.